After a successful first year, the Play Ball 5K returns for a second season on Saturday, April 16 at 9 am at the O.co Coliseum. 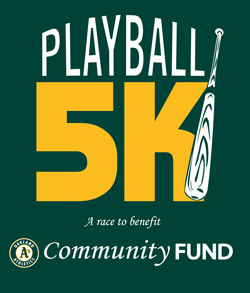 Celebrating the start of another great season of A’s baseball, the Play Ball 5K will start on the field, follow a portion of the Martin Luther King Jr. Regional Shoreline, and finish in the O.co Coliseum parking lot. All entrants will receive a ticket to that day’s 1:05pm matinee between the A’s and the World Series Champion Kansas City Royals. A portion of proceeds will benefit the A’s Community Fund, which raises hundreds of thousands of dollars annually in support of dozens of Bay Area charitable organizations. Registration is now open at $45 and will continue through Dec. 1. “Regular season” pricing will be listed at $50 up until Feb. 1.